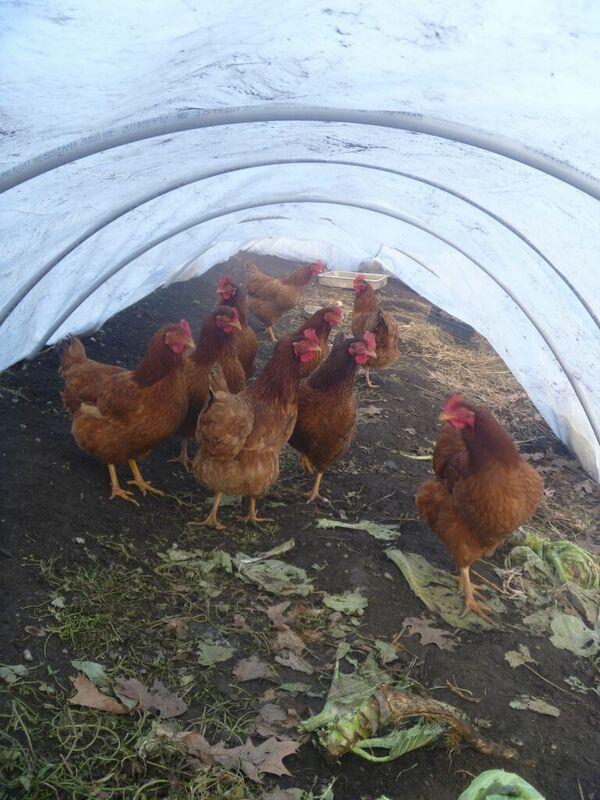 The last two or three years, as we use the chickens more and more to graze green manures, weed fallow beds, or stir sheet compost, winter has found us with birds in the gardens, either in tractors, which we cover with plastic sheeting when the weather gets really cold, or under low tunnels, cleaning up after we’ve harvested whatever was growing in there. This has worked well so far, and not only for the garden services provided: we find that chickens in moveable pens need less feed, even in winter, apparently finding things to eat in their daily allotment of garden soil; also, for some reason it is these birds, the ones under plastic, who lay the most eggs in winter. No supplemental light, no heat (except the solar heat trapped under the plastic film), but more eggs. Right now the three dozen birds moving over the gardens at the monastery are laying at something more than 25%. Maybe that doesn’t impress anyone whose poultry have constant access to commercial corn-and-soy pellets or crumbles, but our birds eat a much cheaper home mix of fermented wheat, oats, barley, sunflower seeds and millet, supplemented with whatever protein supplement the farm has on hand, mostly milk in one form or another — and almost 30% lay at the winter solstice seems to us a pretty good score. 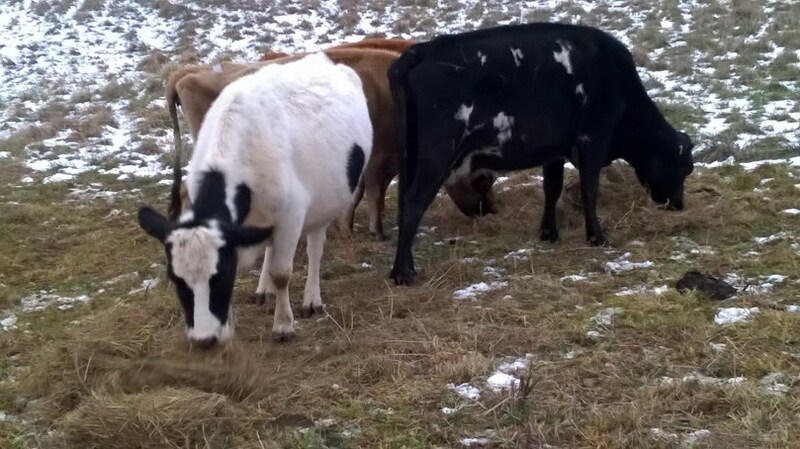 Actually, snow isn’t an obstacle to intensive grazing; cattle will dig through several feet of snow to reach the grass underneath. Snow can even be an asset, cutting down on the frequency with which we have to fill the stock water tanks, since grazing in snow goes a long way toward answering a ruminant’s need for water. In northern Canada, as we learned a couple of weeks ago, some stockmen don’t bother to provide tank water in winter, finding it unnecessary for animals on stockpiled forage. Don’t gasp and be dismayed for the animals before you consider that nature doesn’t provide frost-free spigots and stock tank de-icers either. Of course, using body heat to melt snow takes energy which some farmers think should be spent in weight gain, but then around here running a de-icer costs about a dollar a day, and that’s energy, too. But here in Ohio our snow cover isn’t so reliable, and we have to fill tanks daily (for the dry cows, numbering around fifteen to present date) or every other day (for the two lactating cows). Hoses have to be drained conscientiously , or they’ll be plugged with ice and useless the next time we need them. At least for the next few weeks — then we’ll be moving around to the grass on the west side of the farm, where the spring tanks run all winter. There’s a rhythm to butchering as there is to most kinds of farm work, and a special pleasure in doing a job of parts with other people who know the routine — like playing pickup football with your brothers, or dancing with a familiar partner. Making hay is an obvious example of such work, and butchering is another, the patterns being consistent enough that even strangers, if they are experienced, can jump in or out of the set without breaking the rhythm. The last of the four-year-old layers went into jars on Saturday, and family that was here for a farm visit, having some experience gleaned on other farms, moved into our assembly line without a hitch. The shared work is like friendship, and perhaps like the foundations of community, and may be one of the biggest benefits harvested on a small farm. Moving young pigs from the white barn to the big barn; aren’t these wild piggies? Twice-a-day meal delivery makes these guys very friendly. Spent last week north of Lake Erie and a stone’s throw from Huron, enjoying the wonderful hospitality and friendship of our brethren to the north, the vibrant community of natural farmers who are stewarding the soil in Ontario. We were invited as guest speakers for their annual conference at Blue Mountain Resort, a sort of model Alpine village ski resort, packed when there is snow on the ground but wonderfully hospitable to a few hundred farmers in the end of the off-season. The caliber of farming, and of commitment to going forward as better and better farmers, was really impressive, as is their camaraderie and fellowship that recognizes differences in practice but doesn’t allow them to be divisions in community. Great folks. U.S. farmers, check out what’s going on north of the Lake; it’s not so far as all that, and really good to know our brothers-in-the-soil are doing such a fabulous job up there. Thanks, EFAO, for letting us in on the fun, and for our new-found friendships!